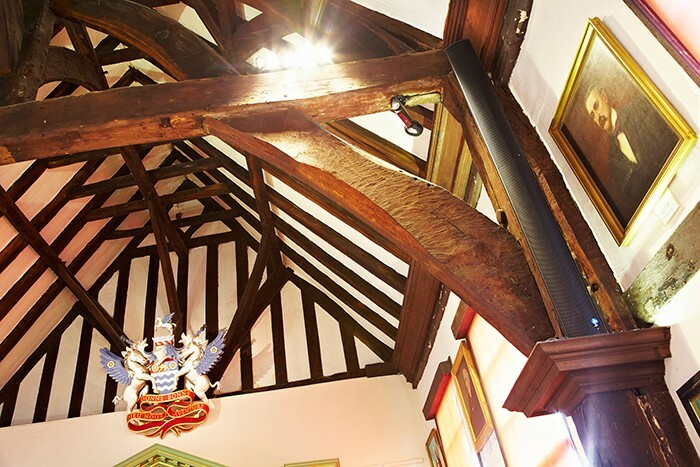 Saville Audio Visual was approached to provide a new speech and background music system in one of the most historic buildings in York, The Merchant Adventurers' Hall. Built in 1357, the hall is still in use today, over 650 years later, as a fully functioning museum, hospitality venue and meeting space. As one of the finest surviving medieval Guild Halls in the world, the facility is Grade 1 listed and the largest timber-framed building in the UK still being used for its original purpose. Saville specified and undertook the installation under a English Heritage directive that the fabric and appearance of one of England's finest medieval buildings should not be compromised in any way. Three systems were installed, enabling individual operation in two rooms, with audio from each able to be fed across all or part of the venue to retain maximum flexibility. The large room was equipped with a speech and background music system as well as a conferencing system, whilst the small room now has its own speech-only system. At the heart of the system is a Biamp Nexia digital sound processor and the wireless radio microphones for speech and conferencing were from Beyerdynamic. CD and iPod inputs were installed in the main room, as well as an additional iPod input in the small room, providing the modern flexibility required by event organisers looking to hire the facility. Designed to be, heard but not seen, colour-matched Renkus Heinz speakers were installed in the main room, blending almost invisibly on the timber pillars. The advanced speaker technology enables perfect coverage for almost any audience area, with multiple sonic beams individually ‘shaped’ and aimed from each speaker array with great precision. This precision was fundamental to ensure accurate, natural sound across the required area whilst avoiding colouration of the sound from the interior's many hard surfaces and vaulted ceilings. Without compromising the hall’s visual aesthetics, the installation has improved, beyond all measure, the quality of the sound on offer. He said: "English Heritage were understandably quite stringent in their demand that the installation should be discreet in its surroundings. We felt confident we had succeeded when the first post-install visitors didn't actually notice the speakers and yet were knocked out by the quality of the sound!"